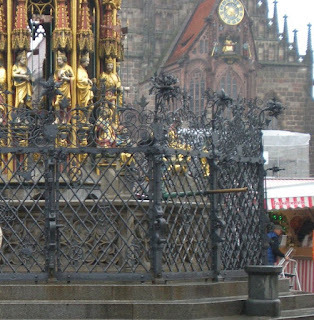 When most people think of Nuremberg, Germany one thing comes to mind - The Nuremberg Trial. And like most people this too was once my initial thought. The mention of Nuremberg conjures images of a hardliner and a place with sordid history, not exactly the image of a bucolic serenity of the Bavarian ‘Romantic Road’ we visited the day before. Nuremberg was almost completely obliterated by the Allied Forces during World War II in the Battle of Nuremberg and was rebuilt from scratch. Today it seemed unscathed by the horrors of war. It was a little damp when we arrived, and the rain made the rust and brown-colored rooftops glisten, highlighting the medieval aspect of the city. First, we walked to the Old Town Square to see the Schöner Brunnen (Beautiful Fountain), and rub the rings from the fountain gate/fence for good luck. The ‘Beautiful Fountain’ lived up to its name. It looked like an elongated metal tiered wedding cake, supported by heavy decorative posts or pillars and topped with passion flowers and Gothic spire. The base was surrounded by a fence in which decorative motifs were carved into the wrought ironwork. Each tier contained allegorical heroes or religious figures. It was very ornate. Then we went inside the Gothic church Frauenkirche (Church of Our Lady). The church façade with the intricate spires and the 13th century old clock were beautiful. Equally impressive was the church interior especially the altar. The light rain could not hold us from exploring the cluster of red and white stripe market stalls. 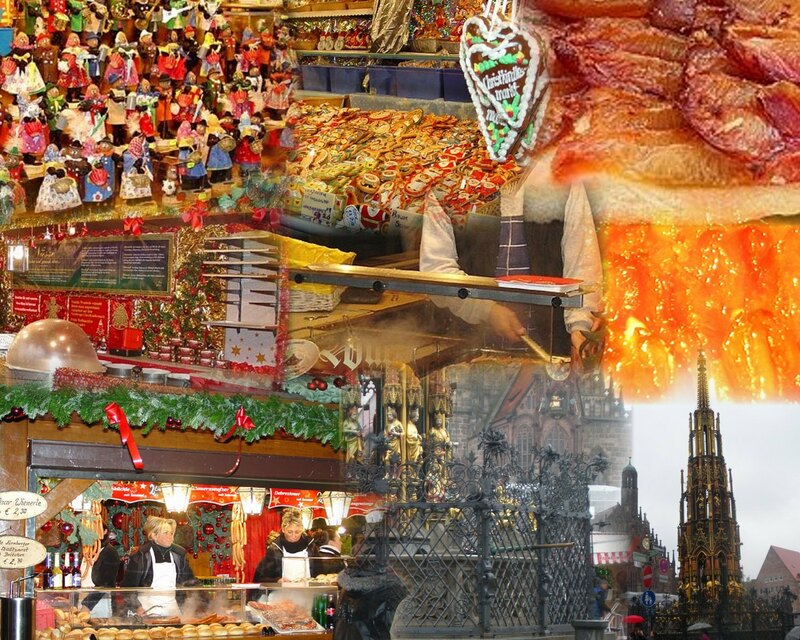 It’s the Christkindlmarkt (Christ Child's Market) that takes place each year at the end of November to December 24! Hundreds of candle-lit wooden stalls cluster around the market square. They were decorated by fresh red and green wreaths and offered an array of yuletide treats: handmade wooden toys, gingerbread houses, handmade gold-foil angels, wooden nativity figures, nutcrackers, and Nuremberg famous ‘Zwetschgenmännle', figurines made from dried plum. There were stalls for the hungry as well that offered sandwiches, Bratwürste (sausages), nuts, and baked goods like Zwetschgenkuchen (plum pie or cake). Fortunately for me (who’s allergic to plums), there were Zwetschgenkuchens made of other fruits. The smell of Lebkuchen (gingerbread cookies) and hot cider warmed the air. Of course all that walking from stall to stall gave me a good workout. Thankfully, there were a bunch of restaurants and coffee houses in the area that offered a wide variety of pastries (Zwetschgenkuchens). 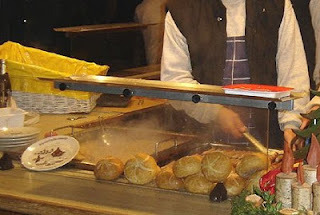 We went across the street to grab some sausages and gluewein (a thick spicy wine served hot). Then it was time to walk off those heavy foods, so we went to explore the surrounding area and to see more picturesque scenery. The House of the Holy Spirit (a former hospital) with its polygonal ridge-turret was a picture of peace and serenity. By nightfall the city was illuminated from the Old Town Market Square to the timbered-house of Albrecht Durer (15th century artist and Nuremberg's most famous son) to the Nuremberg Castle. 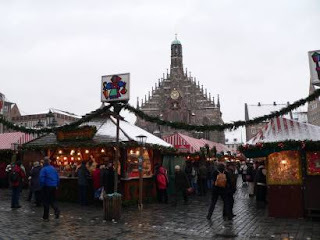 The city of Nuremberg turned into a little winter wonderland medieval village. It had the appearance of having been created by a master Christmas decorator and designed by a toy train village architect, laid out in quaint gingerbread market square. 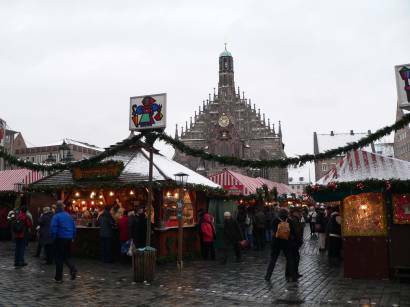 The appearance of a medieval Christmas village was made authentic by the presence of the gothic Frauenkirche (Church of Our Lady) intricate spires, the ‘Beautiful Fountain’, and the surrounding timbered buildings. Christkindlmarkt (Christ Child's Market) helps rid the air of any lingering remnants of those horrific times and brings the city to a joyous life at advent season.